I will confess to not having the foggiest as to what 'pigeon dating sim' actually means. I know what each word denotes on its own, but put them together and it's all so much Swahili. That hasn't stopped Mediatonic from remastering pigeon dating sim Hatoful Boyfriend's Christmassy sequel, though, no sir. Hatoful Boyfriend: Holiday Star is coming to Steam on December 15. 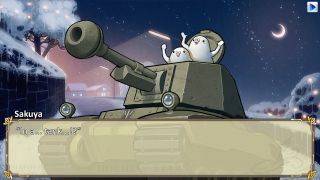 If it helps sway you, Julian Murdoch warmed to Hatoful Boyfriend in our review, calling it "a one-of-a-kind glimpse into the world of anthropomorphic-animal Japanese otome", but to confuse things, I'm informed that Holiday Star is not a pigeon dating sim itself. It's just a pigeon sim. At least, there are pigeons, two of which are in a tank. Yes, my grasp on reality is slackening coo—I mean too.